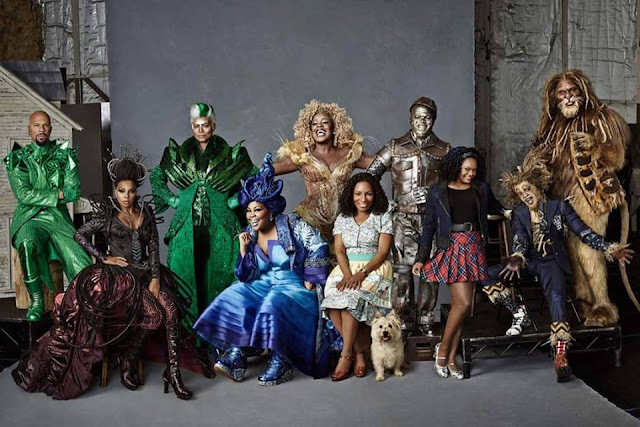 If you saw the live presentation of the current day adaptation of "The Wiz" last night on NBC, you saw a real treat. To celebrate the 40th anniversary of the broadway hit turned classic film, NBC called on the a stellar cast! Mary J. Blige, Common, Queen Latifah, Amber Riley, Neyo, David Alan Grier, Elijah Kelley, Stephanie Mills, Uzo Aduba, and (making her television debut as Dorothy) Shanice Williams..were all phenomenal! Not only was the acting great, but a good musical requires a-one vocals as well. The actors on this show gave me so much life in their musical moments. Shanice Williams has such a sweet tone, Uzo Aduba shocked many people with her number, Stephanie Mills is still incomparable, and lets not forget about Amber Riley's chops. From beginning to end, the cast gave their best. I felt like every note, and every move was intentional. I loved it. There was all sorts of backlash surrounding this presentation, and I think thats just fine. It's hard for this country to embrace our culture and our efforts because they've tried to keep it all burried for so long without much success. Who cares that the cast was all black. How many all white films/broadway shows are out there? Please get over yourselves. The point is truly missed if the focus is on that. Black, white, asian, whatever... these actors are all undeniably talented, and I think they did this well! See some of the moments below!